The vision of Mary Handy’s team is to provide customer service that is second to none. To do so in a delightful, friendly and professional environment using up to 99% naturally derived products is fundamental. 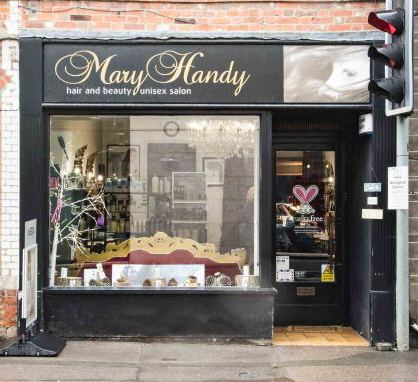 Situated in the centre of Wallingford, Mary Handy Hair and Beauty is the obvious choice for people living in Benson, Goring, Henley, Marlow, Thame and of course Wallingford itself. The vision of Mary Handy’s team is to provide customer service that is second to none. Thank you so much for my amazing new hair style. I really love it! The bubbly and the massages really made the whole experience brilliant! I would recommend this place to anyone. Struggled for years to find a place that could cut my hair just how I asked them to…then I found these guys! Friendly staff, a lovely, warm studio space and the knowledge and skills to leave you feeling completely satisfied with your awesome new hair do. 10 out of 10! Sign up here to our mailing list and keep up to date with news, offers and events.